For the first time since PEJ launched the New Media Index in January, the conflict in Afghanistan was a major topic in the blogosphere, dominating the conversation last week. For the week of August 31-September 4, the Afghanistan situation generated 26.3% of the links in blogs, and that discussion was almost entirely focused on an article by conservative columnist George Will advocating a U.S. pullout in Afghanistan. The bloggers seized on different elements of Will’s column in their responses, but the prevailing reaction was critical. Last week’s spike in online interest in the eight-year-old war corresponds with a recent uptick in coverage in the mainstream press. For the week of August 31-September 6, Afghanistan was among the top stories in the News Coverage Index, accounting for 9% of the newshole. 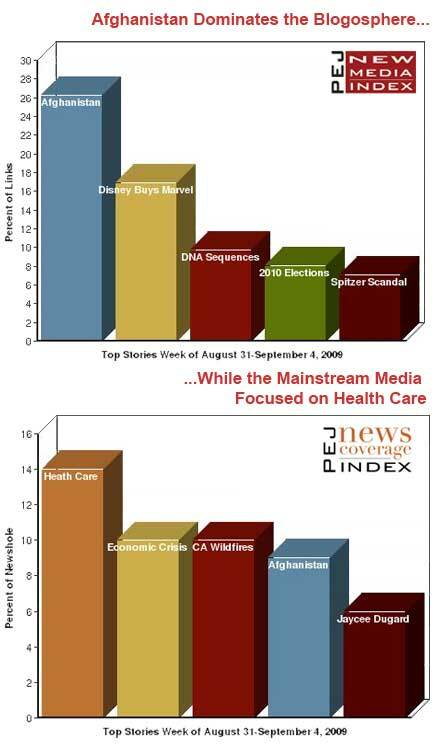 Apart from that topic, the online and mainstream news agendas differed dramatically last week. The second-largest story in the blogs, at 16.9% of links, was about Disney buying Marvel Comics for $4 billion. This was followed by a story about how every human being has mutations in their genes (9.7% of the links), a story about the 2010 Congressional elections (8.1%), and a story about former New York governor Eliot Spitzer’s possible political ambitions got 7.1%. As part of a pattern that has emerged in the New Media Index, Twitter focused mostly on technology last week. The lead topic on Twitter was Twitter itself, with 15.9% of the links connecting to twitter features such as business opportunities Twitter offers and a new site that creates archives of personal Twitter feeds. The second biggest story on Twitter, with 13.7% of the links, was about the Apple iPhone’s relationship with AT&T. And the No. 3 story (7.5% of the links), was the two-hour outage of Google’s email service, Gmail. In the blogosphere, George Will’s article on Afghanistan was a catalyst for comment. Will, a prominent conservative thinker and columnist, offered a dovish position, advocating that the U.S. pull out of Afghanistan and refocus our strategy on hunting Al-Qaeda. Will’s column generated considerable attention because it seemed to run counter to the views of many conservatives. Among blogggers, the general response was one of criticism, albeit for varied reasons. A self-identified Democratic blogger, honest partisan, lamented Will’s argument. "Part of the argument seems to be that setting up a stable centralized government in Afghanistan is a futile effort, that a troop presence in Afghanistan isn’t necessary to defend against Al-Qaeda, and that we’re killing civilians there…which is both immoral and counterproductive to our efforts to turn the Afghan population against the Taliban." Another blogger argued that Will’s timing was off. "But there’s no reason to come to these conclusions now;" writes beinstein, "these arguments should have been made while President Obama decided to send more troops in February or they should not be made at all." Other bloggers, however, agreed with Will’s assessment. "Yes, George F. Will it is time to get out of Afghanistan…" writes gringo lost, "And if our principle mission is-and should be-to ‘disrupt, dismantle, and defeat’ AQ then we can do that mission better by using tactics focused on countering terrorists, instead of diverting attention to fight drug kingpins or battle for "hearts and minds" against an anti-Karzai insurgency." The No. 2 story in the blogs was about Disney buying Marvel Comics, a merger between an entertainment industry giant and the creator of such famed fictional characters as Spiderman, the X-Men, and Ironman. Most bloggers discussed the implications of the deal, and occasionally their fears of its consequences, but almost none criticized it. "It’s interesting that comic’s Big Two are now owned by larger multinational conglomerates. Time Warner owns DC and now Disney owns Marvel." Writes neo_prodigy on his blog The Chronicle, "Like everyone else, I’m curious to see how this will play out. Time Warner opened a lot of opportunities for DC with the movies and the cartoon series, time will only tell what Marvel will do." The most popular news clip on YouTube last week was a Brazilian news story about a teacher who was fired after a video of her dancing provocatively at a nightclub was posted on the internet. No. 2 was a homemade video of a man at a health care rally with an anti-Obama poster that a police officer tried to take away from him. The man, who was on school grounds, argues with the officer and a school official about his first amendment rights to display the poster. The third most-watched video was of a plane crash at an air show in Poland. 1. Clip from a Brazilian newscast about a teacher how was fired for a video of her dancing provocatively at a club. 2. Home video of a guy at a health care rally who got his poster taken away by a police officer, argues with the officer. 3. Video of a plane crash at an air show in Poland. 4. Clip from Glenn Beck on Fox News spelling "oligarchy" wrong. 5. Clip of the beginning of Obama’s eulogy for Senator Ted Kennedy.